"Our Spirited 380 'Ta Heke' sails great, with Suella and I getting up to 18 knots with one reef in and about 25 knots of wind. 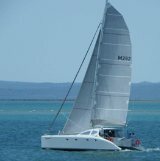 This week we sailed the Kingfisher Bay regatta which was a four day six race event over at Fraser Island. We won the multihull division and were only beaten across the line on each race by a 33 foot racing pod cat. With 6 crew on board for the four days we are really pleased with how Ta Heke performed even fully loaded up with supplies for the event." "I was invited by Craig Schionning to join his crew and assist with the demonstration sail on the new Spirited 380 that took place on Pittwater. 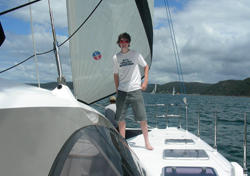 Most of the guests had experience on sailing monohulls and were looking to change over to a catamaran. Some had never set foot on a multihull and were immediately impressed with the easy access on board, it’s stability and the ease of access to the foredeck via broad flat decks where rigging position did not impede. The saloon with the galley up layout was a hit with the ladies especially, plus the wide steps leading to the accommodation in the hulls. It was surprising to see how much cockpit space there was for around 8 people, to be able to walk around and find a suitable spot to either help sail the boat or just enjoy the trip and give their reactions to the vessel in general. The conditions were fairly brisk early on with a good 15- 20 knots pumping in from the South East and later we experienced occasional gusts around the 25-30 knot mark, although the conditions did moderate later in the afternoon. 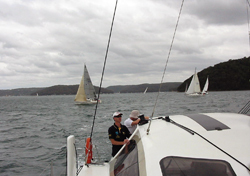 The marina at the RMYC is located at the Southern end of Pittwater so with the conditions it was an off the breeze run downstream followed by a hard punch to windward on the return trip so the guests had a variety of conditions in which to judge the performance of the Spirited 380. Coming from the monohull fraternity most of the guests were amazed how the boat immediately started to sail at a reasonable speed as soon as the sails were hoisted and set. 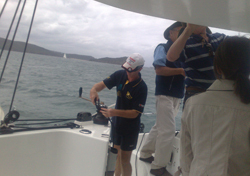 Craig encouraged them to participate in sailing the boat which they thoroughly enjoyed and showed the confidence that he had in his Spirited 380 design to handle the conditions. Sailing at GPS speeds in excess of 14 knots off the breeze and 9 knots to windward showed how well and easily the boat handled the conditions. Under power the twin Nanni diesel saildrives located in separate engines spaces aft easily pushed the boat along at 6 knots into wind and Craig showed how easy it was to maneuver when leaving and coming along side the dock in a congested marina area. Judging from the reaction at the end of each demonstration and subsequent contact from some of the guests, the demonstrations were a roaring success. For my part thanks Craig and the team for a great day out. It was great to meet all the guests and hear about their exciting future plans." 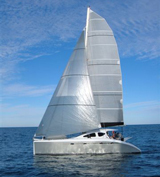 "I have been a monohull sailor all my life in both skiffs and yachts, this was the first performance catamaran we had sailed. With around 15kts of SSE the Spirited 380 settled at around 11-12 kts on a broad reach with full rig minus the screacher, She handled easily and had extremely good visibility from the twin helms and through the saloon. The windward performance was impressive to say the least; after getting the hang of driving her through the tacks, the acceleration out of the tack was fantastic even with ten people on board. The boat had every good pointing ability and sat on around 7-8 kts with one reef in the main. My summary of the sailing is that this boat can be easily handled by a couple with reasonable sailing ability. It can be powered up and turned into a weapon or depowered for the less adventurous. Deck space is excellent as is the cockpit area. All in all we loved the boat." "...I haven't sailed many large cats, but the ones that I have done are usually as much fun as towing caravans. My main experience has been with 14ft cats with standard rigs as well as somewhat more interesting rigs we designed nearly 30 years ago when things were starting to move with C class cats. The spirited 380 gave you the feeling you enjoy as the wind picks up a little and she lifts the bows and gets in the groove. Just like a small cat, you could use the gusts to your advantage. With the centreboards, pointing was great! There was also no issues at all with a 1.5m chop. It is a light boat, and it just goes over the waves. 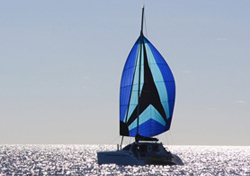 In all I was impressed by its liveliness, it was fun to sail..."
"My first sail on a Spirited 380 fully justified my decision to purchase and build one. As a racer turned cruiser I was impressed by the way the boat tracked to windward in both light and medium airs. It was both balanced and responsive and was fun to drive to the tell-tales on the breeze. The last sail of the day was a broad reach in a medium breeze and the boat really kicked up its heels and demonstrated the speed that will be a delight on those longer passages. I can't wait to get mine in the water!" “On Friday the 11th of May 2007 we took Stallion Marine’s first Spirited 380 for it’s maiden voyage. Not knowing exactly how the boat was going to perform, we loaded the boat up with a good crew and took off down the canal at Minyama on an afternoon that had a gloomy and cloudy feel. The palm trees had a good sway up and we predicted there was about a 20-25 knot Southeaster blowing. I knew it was going to be a good day for giving this sleek cat a good test sail. On approaching the Mooloolaba seaway it was clear that there was a good swell running with white water breaking across the bar. With the boat sitting nicely on her lines we got across the bar with out a glitch. The boys from Ullman Sails moved up to the bow as we went head to wind and started pulling up the 58sqm main. There was talk of a reef but I knew the boat had been built well and I really wanted to see what she could do. Once the head board was home I came off the breeze and started reaching out to sea. The boat had a good motion as she was sliding over the 3-4m swell with out a slap heard, we knew we had another tick in the box. The headsail was furled out and the boat really started to pick up speed. The large over-lapping headsail has got plenty of grunt and balanced her out nicely. The GPS was now reading around 18 knots boat speed and as we were still in the bay the wind was gusting at around 18knots. We gibed in and out of the bay a few times just to get a feel for the boat and let every thing settle in. With no problems evident, we moved out of the shadow of the bay and got into some consistent wind were we could get the boat in a rhythm. We all got excited when we got onto a nice swell and held 23knts on the GPS for a good minute. Realizing we had been sitting on 23 knots and not a drop of water coming over the bows we knew it was possible for us to push this boat a lot harder. With the sun starting to fade we thought it would be time to head back in as we still did not have the nav-lights wired in yet. Once the other sails had been completed by the Ullman boys (screecher and kite) we now had the extra horse power to try and get some higher digits on the GPS. We proceeded out off Mooloolaba again with a nice winter Westerly blowing straight off the beach. A group of 10 people were on board for this social sail with beer and champagne. With the boat heading north under main and headsail we thought it would be time to change gears and see what the screecher looked like. We had the boat sailing along comfortably in the flat water at about 19 knots. We then decided put the kite up and go a bit further out to sea were the Westerly was stronger and more consistent. The spinnaker was great for coming right off the breeze, we were able to run really deep. The boat got up to a smooth 25 knots with people still standing around casually sipping on drinks! The major benefit of the 380 is the sense of smooth and safe sailing. Because the boat is always moving through the water at good speeds in it’s respective sea conditions, it has a nice motion instead of hobby-horsing as some cats do. From a safety point of view, you are able to push the boat hard and always feel like you have total control."